For many digital photographers in the late 1990s and early into this decade, iView MediaPro was the image manager of choice. It was fast, flexible, and easy to use, complementing Adobe Photoshop ( ) and providing a clean way to manage your files. In mid-2006, Microsoft bought MediaPro's parent company, iView Multimedia, and the program is now marketed as Expression Media, part of Microsoft's Expression Studio line of Web and graphic design applications (all of which, with the exception of Expression Media, are Windows-only). It's now also bundled into a special edition of Microsoft Office 2008. Version 1.0 of Expression Media is almost identical to iView MediaPro 3.0, which first shipped in 2005. Microsoft has updated it as a Universal application, but big changes aren't planned until Version 2.0, which is slated to arrive later this year. As a result, Expression Media has gotten little attention as analogous programs like Apple's Aperture and Adobe Lightroom ( ) have shipped and taken center stage. But Expression Media is a solid and easy-to-use asset management tool that is worth a look, especially if you prefer to have a bit more control over your workflow, or if you wish to manage file types that go beyond images. 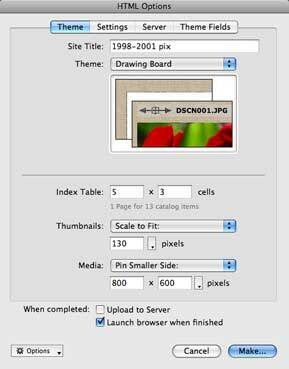 You can view an Expression Media catalog in three ways: as a Finder-style List view, as a grid-like Thumbnail view (shown), and as a Media view, which shows the selected image at full size. The heart of Expression Media is the catalog. Each catalog is a visual database that contains information and thumbnail images of the files that it tracks. The program doesn't store your files in the catalog, just reference information, metadata, and thumbnails. When you create a new catalog, you have the option of specifying what type of files get catalogued, and adding files to the catalog is easy: you simply drag files and folders into the catalog's window. 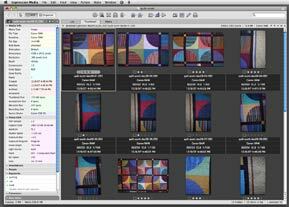 Expression Media can also import files from a digital camera via Apple's Image Capture program, and you can build a catalog on the fly from a Spotlight search. 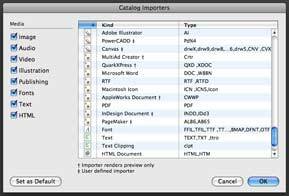 Catalogs can have up to 128,000 files in them, and Expression Media includes comprehensive searching and sorting capabilities, cross-catalog integration, and more. Once you create a catalog, you can perform batch operations on the referenced files, including renaming, moving and copying, and archiving to optical media. These file management tasks are quite handy, especially if you want tight control over your workflow. And, with Expression Media's solid AppleScript support, you can accomplish highly sophisticated tasks with a little bit of work. When creating a catalog, you can choose which file formats are included. Part of Expression Media's strength is its ability to read a variety of file types, including standard publishing documents. Expression Media uses QuickTime as its rendering engine for graphics, which means that it supports most of the Mac's common image and movie formats. This also includes many raw formats used by digital camera manufacturers, which is great, but it also means that some newer cameras won't be supported until Apple updates the OS (this is also an issue with Aperture). One of Expression Media's strengths is its speed. Since it doesn't render images at full size like Aperture and Lightroom do, you can zip through a catalog quickly, rating images, comparing them, adding keywords, and more (Aperture 2.0's new Quick Preview feature provides a much needed boost to its browsing speed, as we found in our Aperture 2.0 First Look). Expression Media has extensive support for tagging images with metadata like keywords and copyright and creator information, and you can even attach voice notes to an image or file. You can't add metadata when you're importing files, which is a drawback, but overall, Expression Media's data-editing features are quite good. Expression Media's Web gallery feature looks simple on the surface, but the application's template-driven approach means that you can create customized templates that match the look of your own sites, something that is hard to do in programs like Aperture and Lightroom. Expression Media has better support for creating customized Web galleries than any of its image-management competitors. You can't create Flash-based sites as you can with Lightroom, and it lacks the slick Web Gallery feature found in iPhoto and Aperture 2.0, but Expression Media's template-driven design is quite sophisticated, and you can easily add templates that incorporate your own branding and site look-and-feel. If you're a photographer or artist, it's often crucial that the galleries you build look like the rest of your site, and Expression Media makes that easy if you're adept at HTML and CSS (or have someone who handles it for you). You can also create slide shows from image catalogs. Expression Media's slide show feature is satisfactory, about on par with those found in Lightroom and Aperture. You can't add audio to a slide show (beyond any voice annotations you might have attached to an image), but you can export a slide show as a silent QuickTime movie. At $299, Expression Media's biggest limitation is its price. Lightroom, at $299, and Aperture, which is now $199, include image editing and image management capabilities. With Expression Media, if you're just getting started, you'll also still need to invest in an image editor like Photoshop or Photoshop Elements, which adds significantly to the cost of your image management system. If you already have an editor, and want more than what Adobe Bridge provides, Expression Media is good, but we think more people will still go for a program like Lightroom or Aperture, or even iPhoto, just to get more expansive editing capabilities. However, if you prefer to maintain your own system for tracking, managing, and archiving images--and other kinds of media--Expression Media is a solid and easy-to-use program with some great file-management capabilities. EDITOR'S NOTE: Updated on Feb. 29, 2008 at 11:04 a.m. PT with detailed information about Aperture 2.